Proposition 64 passed statewide in November 2016. Recreational marijuana possession and use were decriminalized, and procedures for medical marijuana, first approved in 1996, were refined. I offer an honest hooray for that, as do many voters who didn’t believe marijuana use should send a person to jail. Many of those voters, however, got a bit more than they bargained for. While Prop.64 decriminalized recreational marijuana, it also gave local jurisdictions the right to regulate how Prop. 64 would work locally. They were given 13 months (until January 1, 2018) to develop ordinances regulating marijuana, otherwise the state would mandate its own. The current Plumas moratorium has extended our deadline to late October 2019. The Board of Supervisors (BOS) designated a committee, the “Cannabis Working Group” (CWG), to develop an ordinance for Plumas County. Its members were pro-commercial marijuana sympathizers. Some were growers, all were interested in making commercial marijuana legal here. Their draft ordinance was permissive enough to raise eyebrows among other citizens not so inclined, including some who had become aware of the fallout other counties had experienced when they approved commercial growing. In my opinion, the weakening of the General Plan to favor this single business interest was not appropriate. The CWG draft ordinance would have allowed commercial marijuana cultivation in every zone, including residential, without the usual provisions for environmental review insured by CEQA (California Environmental Quality Act) and NEPA (National Environmental Policy Act). It would also have bypassed the Special Use Permit process, which gives neighbors the power to weigh in on activities that will be conducted near their properties. The appropriation of the term “caregiver” to describe a grower who holds prescription cards for patients is an example of savvy marketing, but it has denigrated the service of true caregivers as we’ve previously used the term. Applicable law defines a caregiver as someone who provides housing, supervision, food, and medication for patients. Medical marijuana growers producing plants for patients with prescriptions are not “caregivers” in the same way, rather they’ve grown product on behalf of a patient but could not, under Prop. 215, legally “sell” that product to the patient. They have, however, been able to illegally sell their excess product to other users, and they have done so, taking advantage of a loophole in the proposition. The initiative sponsored by Firestone/Lucia leverages this “caregiver” euphemism by stating that permits would not be required when growers serve up to five patients with free marijuana. Here’s the math: 6 plants x 5 patients = 30 plants, plus six of growers’ own, totaling 36, all produced without permits from the county. What are the chances all of this production would be given free to medical marijuana users? More likely, excess product would be sold, and that, friends, is a commercial operation, not a compassionate service operation. Anyone can promise anything—as long as P.T. Barnum’s words are in play. “There’s a sucker born every minute.” The arguments being made by the commercial-grow folks include the promise that county coffers will swell with permit and licensing fees, plus lots of taxes on sales. As a cash business, commercial marijuana doesn’t maintain third-party, audited records from which appropriate taxes can be calculated and then paid. Because marijuana is still illegal at the federal level, no banking services are available to the industry. (For the price of a phone call to Sacramento, you can talk to that city’s Pot Czar and get this fact straight from the horse’s mouth.) What do we say about a “deal” that sounds too good to be true? Plumas County’s largest marijuana grow is in Sierra Valley (now illegal due to our moratorium). They estimated their 2017 net profit at over $4 million, but the cash is shipped in boxes to an offshore bank from its Los Angeles operation sans taxation, hence no financial benefit to Plumas County whatsoever. The Bunch/Scott initiative calls for commercial marijuana businesses, but only for local growers, not out-of-county interests. The subtext here is that we can trust local growers because they care more about the county than do big corporate interests from elsewhere. This is a business drawbridge, intended to reserve opportunities only for locals. If voters were to approve this initiative, the county would have to deny outside marijuana businesses to set up shop. This unconstitutional exclusion would undoubtedly be legally tested, and it will be the taxpayers who foot the bill for the county’s legal defense, not the growers behind this initiative. How does that benefit us? If the statewide price of marijuana continues to fall, will these indoor businesses fail, leaving metal-clad buildings on what was once lovely meadow vistas? How do metal buildings conform with the principles of the 1965 Williamson Act, which was intended to protect agricultural land from non-agricultural uses (of which industrial-scale marijuana is one)? Don’t be fooled by claims of a better future for Plumas through these initiatives. We need to let the Planning Commission and the BOS work through the standard process that allows public input on multiple draft ordinances waiting to be considered. The proponents of these initiatives have not explained how their commercial marijuana profits would be taxed into the County Treasury. They have not shown how regulatory oversight would be adequately supported by the industry itself, not the taxpayer. They have not explained how long-term permanent employment would be sustained and for how many, and they have not offered to pay for the costs of environmental analyses. No other rural county has created satisfactory regulatory control over commercial marijuana, including the industry’s expansion within its boundaries, the thwarting of related illegal activity, or the collection of sufficient tax revenue required to enforce oversight and prevent environmental damage. Is it reasonable to assume a different outcome in the form of a “Plumas Miracle?” Why take the risk? Allowing commercial marijuana cultivation would result in a net economic loss and is a poor choice to protect both the natural resources and rural lifestyle we enjoy. Don’t be fooled. Decline to sign these ballot initiatives, and if they do make it to the November ballot, vote them down. Bill Martin is a retired community college instructor of forestry, biology, and natural resources. → Could this happen in Plumas? Well said Bill. I would like to see your comments reach the Bulletin. Great information, with consequences noted. Thank you. As a society we don’t pay enough attention to all consequences. False. Current moratorium is good until May 2018, where they will vote whether to amend or revise the moratorium. False. This is why prop 64 passed in California, and locally, because the state wants their cut. In 2016, roughly 30% of cannabis businesses paid the Board of Equalization taxes. Non-profit business models are different than not-for-profit. There are other stipulations placed on cannabis businesses such as the inability to write off farming equipment, soil, and other costs agricultural farmers usually can. Also, a requirement for a company to get a state license is that they show proof of legally operating (i.e. a tax ID). False. Priority residency sunsets in 2019. This was to avoid a Calaveras -esque scenario of exploiting what the County has been feverishly trying to regulate for the past two years. Sec. 11-5.152.- “Priority Resident” means an individual who can provide proof of prior cannabis activity in compliance with the Compassionate Use Act on a scale greater than personal use, prior to September 1, 2016, and who qualifies as a Resident in the County of Plumas for a license under this Ordinance. Priority Resident is a temporary status that shall expire on December 30, 2019. Sec. 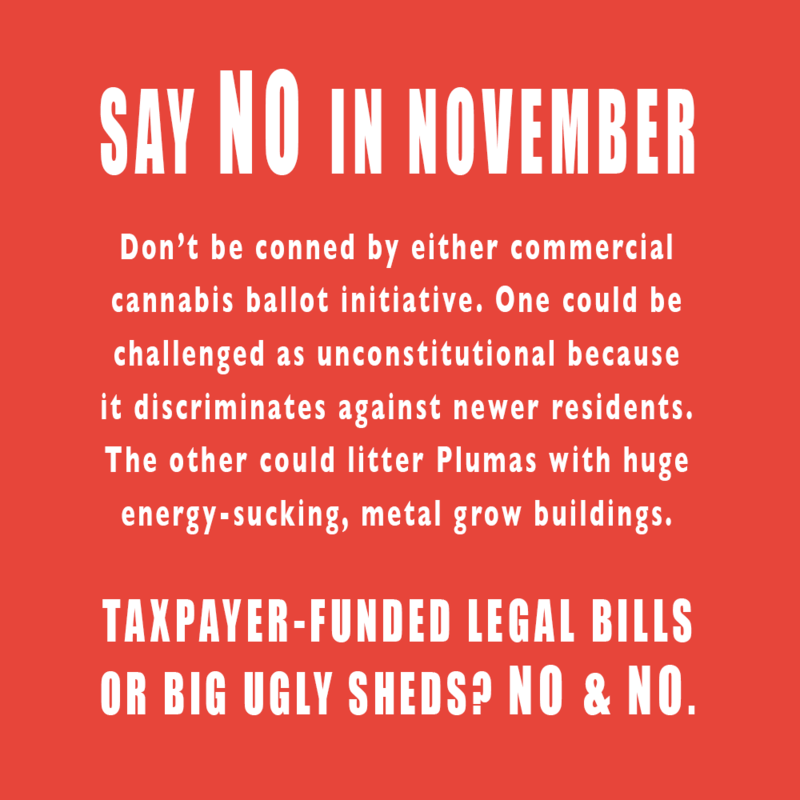 11-10.1.101.- In order to limit potentially deleterious population growth that may follow approval of commercial cannabis activity in the County, and in order to avoid the strain on limited County resources that such a spike in population growth may cause, the County will place a temporary limit on the number of Licenses issued to Non-Residents. Until December 30, 2019, Licenses issued to Non-Residents shall be limited to ten percent (10%) of the total Licenses issued. The remaining ninety percent (90%) of Licenses during this period will be issued to both Residents and Priority Residents. False. Besides the non-refundable permit fee ranging based on license type annually, the taxes are laid out in the following sections, all of which can be accessed on KeepPlumasGreen.com with graphs and other cool statistics for people to get familiar with. Sec. 11-16.102.-The General Tax shall be set at two percent (2%) of net profits. The Board of Supervisors may increase the General Tax by no more than one percent (1%) in any given year, and the Board of Supervisors may increase the General Tax no more than four (4) times. Sec. 11-16.104.-Proceeds from the General Tax shall be deposited into the County’s general fund. Sec. 11-16.105.-The tax proceeds will be subject to the same independent annual audit requirements as other general fund revenue. The audit report will be a matter of public record. Sec. 11-19.2.101.3.- The ordinance is exempt under CEQA Guidelines Section 15301 (existing facilities) since the permitted cannabis businesses under the ordinance may locate in existing facilities, and any additions to structures would be expected to be also exempt under 15301. The quality of the rebuttal to my April 2nd essay signifies the quality of the remainder of the rebuttal comments, which I won’t take the time to refute. Rebuttal comment #1 flatly stated that the Board of Supervisors had to meet to renew the moratorium in May, 2018. It is now August, 2018. Check the BOS meeting minutes for May and you’ll find this never happened. If you check last winter’s BOS minutes, you’ll find that the moratorium was extended to October 24, 2019 (just as I claimed), making for a total two year moratorium—the maximum permitted by state law.